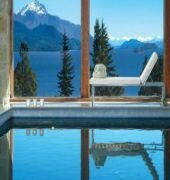 The historic hotel\'s majestic European-style architecture can be seen from the Nahuel Huapi lake. The hotel grounds include a private dock and guests are invited to stroll around the park and contemplate the carefully preserved landscape. 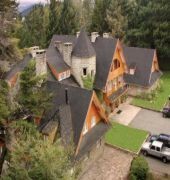 The hotel is a historic Andean mansion which has 40 single and double rooms, apartments and suites, all of which have a privileged view overlooking the woods and the lake. 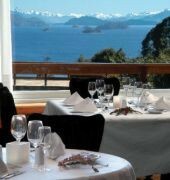 Restaurant Del Bosque, one of the most well-known restaurant-bars of Villa Llao Llao, is located in the hotel. Further facilities include a reception hall with a 24-hour reception desk, a hotel safe, currency exchange facilities, a cloakroom, lift access, a cafe, a games room, Internet access, top quality room service, laundry service, bike hire, a car park and garage, a kids%u2019 club, a playground and a unique conference room for up to 400 people.This hotel offers its guests a different Bariloche. In winter, the guests can enjoy the heated swimming pool and ski lovers can go to Cerro Catedral ski runs. The hotel also has an exclusive health club with a sauna, a massage room, an alternating hot and cold water shower and a complete gym. There are sun loungers and parasols, water aerobic classes, a sun terrace, a steam room and spa treatments. Other activities available to guests include cycling across the forests, mini trekking in the company of a guide, travelling with a guide by SUV to Cerro Otto and climbing the path that leads to the summit and, 1100 meters up the hill, visiting the place where Otto Meiling, a pioneer and expert climber, once lived. Guests can also reconstruct the past of the region with a visit to the Museo de la Patagonia (Patagonia Museum), where displays depict the area%u2019s first inhabitants and the desert conquest, or by visiting the archaeological ruins near the hotel. Guests can also take a walk along the streets and discover the remaining early 19th century houses with their warm wood, emitting a mountain village atmosphere, or visit the workshop of one of the most important Argentinean painters of local customs. Motor boating, catamaran boating, canoeing, tennis, table tennis, aerobics, basketball, volleyball, snooker and horse riding are also on offer. The hotel also has entertainment programmes for both adults and children.